The Ross Clan deck is standard deck of cards with 4 suits, ace-king in each suit with 2 jokers. These beautiful playing cards are a sure hit for all the card games you like to play. 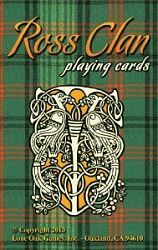 The theme of the cards is based on the Haggis card game.